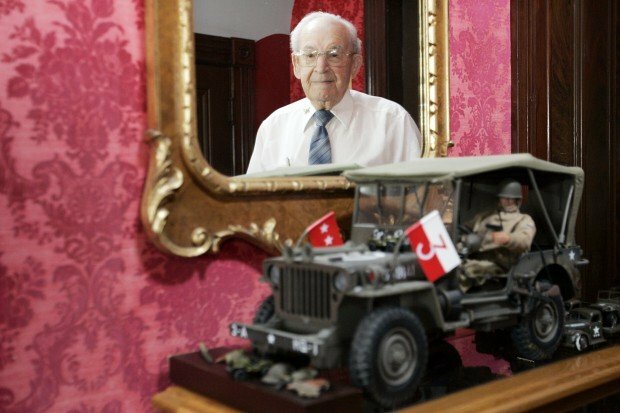 On a table in the foyer of a three-story Victorian home in Napa is a model of a World War II–era Jeep, its paint an authentically flat shade of olive, a red flag with three white stars topping the right front fender. In other households, the model might be a mere symbol of its owner’s interest in vintage cars or military history. But this artifact is a key to the background of its owner: Francis “Jeep” Sanza, a driver for Gen. George S. Patton during the final year of World War II. His conveyance became first his nickname, then his ticket to the side of one of the war’s most legendary and controversial figures. More than six decades later, Sanza, now 93 and a great-grandfather, still signs checks as “Jeep” and remembers the overwhelming personality of his former boss almost as if reliving the events of a few weeks ago. “I do a lot of thinking. When I lay down at night it all comes to me,” he said Wednesday in the home he and his wife, Evelyn, have shared for 50 years. Growing up in the hardscrabble coal-mining town of Minersville, Pa., Sanza bore the rather less imposing nickname “Chickie” as the shortest of five brothers. But his new identity took hold shortly after he was drafted into the U.S. Army in April 1941 and was assigned to test-drive a stubby, agile four-wheel-drive vehicle the Willys-Overland company was developing for the U.S. military. After guiding the four-wheelers on North Carolina torture-test courses that included plowing through the Pee Dee River, Army buddies started nicknaming him after the vehicle — “Jeep” — and the name stuck. 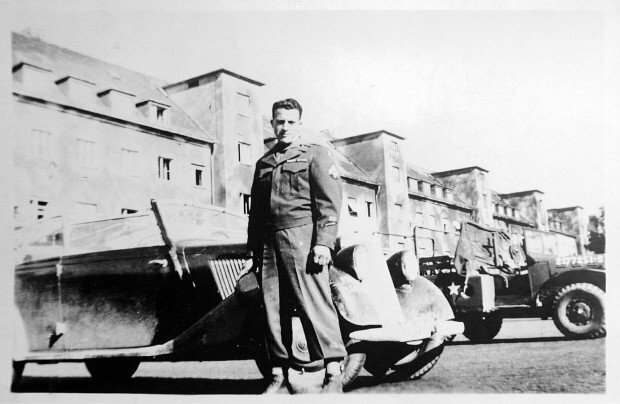 Though Sanza was present for the creation of one of the world’s most famous vehicles, his real brush with the heart of the Allied effort would come in May 1944, when Patton chose him for his team of drivers for the U.S. Third Army’s march across Nazi-occupied western Europe. The Allies were three weeks from D-Day, the perilous crossing from England to the fortified coast of Normandy. A sharp and daring tactician with a gift for inspiring soldiers’ devotion, Patton nonetheless inspired almost as much fear as respect with his volcanic temper — particularly after the general nearly torpedoed his career in 1943 by twice slapping soldiers diagnosed with battle fatigue whom he accused of malingering. What he encountered instead, Sanza recalled, was a paradoxical mix of orneriness and a more reflective side. The general usually knelt in silent prayer before entering the vehicle, only to let loose with his swearing during the conversations on the road — and just as readily keep his thoughts to himself again. Sanza learned to sense when Patton was especially agitated; in such moments, the general would hit the windshield with his riding crop. Over the 10 months on battlefields and roads in France and Belgium, Sanza saw qualities in the general that balanced his angry and moody sides. Many Thursdays Patton set aside for visiting wounded American soldiers in field hospitals, handing Purple Hearts to the most valorous ones. Patton’s determination to stand by his soldiers showed up even in the rare peaceful moments, Sanza said — notably during a brief respite in December 1944, as the German army launched a huge last-gasp attack that became known as the Battle of the Bulge. Seeing a Red Cross canteen truck in Bastogne, Patton told his driver to pull off the road. The woman charged Sanza 10 francs for two crullers and a coffee, but offered Patton his snack free of charge — an innocent gesture that enraged the general, who demanded to see the money she had collected from other soldiers. “So she takes out this orange crate filled with money, puts it down on the ground,” Sanza remembered, still moved to chuckles 68 years later. “He took out a lighter, lit one bill, let it burn and then ignited the whole box. Then he took a shovel from the Jeep and buried the ashes. As the German military crumbled in the early months of 1945, Patton was fired on by his dream of bringing the Third Army into Berlin first, and even of executing swift justice upon Adolf Hitler. Sanza remembers overhauling the general’s official Jeep for the triumphant entry they expected, equipping the four-by-four with a .50-caliber gun, air horns and running boards. But that dream vanished in March when Gen. Dwight D. Eisenhower, the Allied supreme commander and future president, held back U.S. troops and allowed the Soviet army to seize the German capital on May 2. “When he got the word to go no further, he had tears in his eyes that day,” Sanza said. Sanza returned home to Pennsylvania in November 1945, half a year after the German surrender. The following month, Patton died in Germany after breaking his neck in a traffic collision. Sanza’s first postwar job took him west to Mare Island, where he worked in its ammunition department before stints as a beer distributor and Clover Stornetta dairy salesman, a job he still performs part-time in his tenth decade. On Wednesday, Sanza took yet another envelope from his writing desk, pulling out a letter from a German admirer and two black-and-white images of Patton. Above him, in a painting hung high in the corner of the room, the general’s image continued to look upon the man called Jeep. In Patton's own book, he tells of his driver being Sgt. John L. Mims of Abbeville, Alabama. Mr. Sanza may have driven Gen. Patton on limited occasions, but Sgt. Mims was the main driver for the whole war. How do I know this you may ax ? I went to Abbeville at Christmas of 1990 and spoke to him and saw the photos of Gen. Patton with Sgt. Mims at several locations. The photos even showed Patton's converted van that held most of his possessions during the war. That van is now at Ft. Knox, Ky. on display. Again, Mr. Sanza may have driven Gen. Patton on limited excursions, but Sgt. Mims was with him on all three continents, even through Patton's temporary exile without a command in England before the invasion. I brought Sgt. Mims a bottle of champagne that Christmas. We opened it and enjoyed a toast to his service and to the contributions of Gen. Patton to the freedoms of the world. Sgt. Mims was not the driver when Gen. Patton had his tragic accident. Great story . . . Thank you! Just some trivia on a very interesting General that's all. We all have shortcomings and some yes a temper but my aim was to add some trivia some may not know about General Patton and the way he was. God bless "Jeep". So "Napa" what's your point? The man wasn't perfect or polite but he got the job done when it needed to be. No excuses, he just made it happen, it wasn't pretty but then again war is not pretty. I'm trying to figure out how your comments about Patton have a place here. The fact is, Patton was an important and controversial figure during one of the most crucial times in all U.S History and one of our own Napan's has a direct link to it. That's what this article is about, and that's why it is interesting and worth reading. He even mentions the general's shortcomings and temper etc.. but also mentions positive qualities, as those certainly existed too. Thank you for your service Francis, thank you so much. In 1945 as General Patton loved war and toured the battlesites, his 3rd army called him "old blood and guts" One troop replied, "Yeah our blood, his guts" He wanted to get to Berlin so bad his tanks ran out of gas. When General Eisenhower slowed him down, he went into a rage yelling obsenities and how he must get to Adolf Hitler first. He was the only General in the Army that loved war. Also in 1945 when the war was over with the Germans, Japan still had to be defeated in the pacific. General Douglas MacArthur didn't want Patton heading hs troops against the Japanese. He called him "dangerous" Patton retired but speculation surrounds is death to this day some beliving it was a plot to rid Patton of his position in the United states Army. He had a name for the Germans and he hated Russians. Patton was kicked in the head by a horse when he was young which speculation caused his mental outbursts and behavior when in battle with his troops.